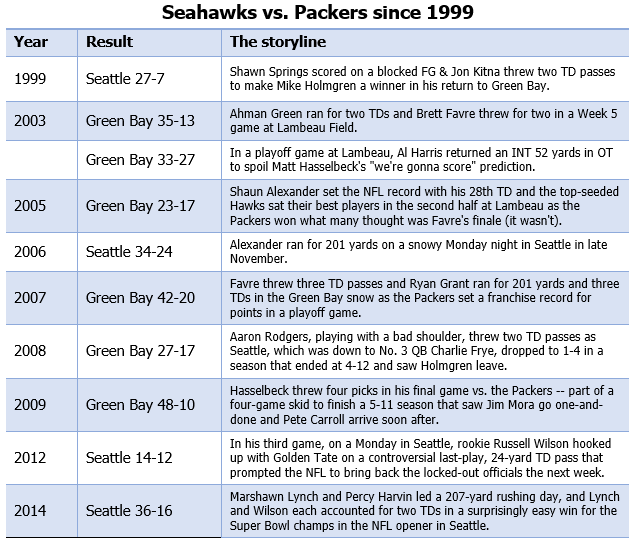 Newer Seahawks fans — and there are plenty of them — might think the Packers-Seahawks series consists of two games: the Hawks’ infamous Fail Mary victory on a Monday night in 2012 and Seattle’s 20-point win in the opening game of this NFL season. But this series was full of great matchups back when Mike Holmgren and quarterback Matt Hasselbeck were leading the Hawks against their old team — led by Brett Favre — and this will be the 11th meeting, the third in the playoffs, since 1999. In 1999, after Holmgren ended a successful seven-year run with the Packers to run the entire show in Seattle, the league made the no-brainer move to send him and his new team to Green Bay for “Monday Night Football.” Seattle’s 27-7 win was the first of six meetings between Holmgren and Favre’s Packers over nine seasons — thanks largely to the Seahawks being shifted back to the NFC in 2002. In the meantime, the pipeline between Green Bay and Seattle remained wide open for players, coaches and front-office execs. The year after Holmgren left Green Bay for Seattle, his offensive coordinator, Mike Sherman, turned around and went back to Green Bay, where he coached from 2000 to 2005 and went 3-0 against Holmgren. In 2001, Holmgren acquired his old backup QB in Green Bay, Matt Hasselbeck, who became Holmgren’s quarterback for five reunion meetings with their former team, including two playoff games. 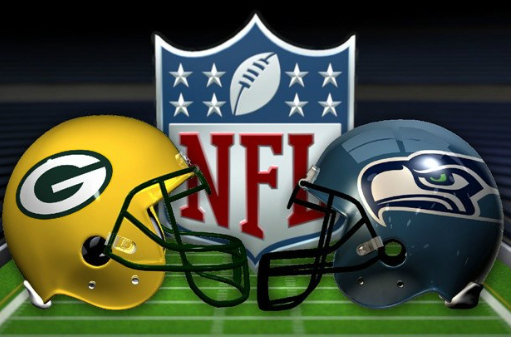 As it turned out, the Packers picked off a pass on a poor route by the receiver on Seattle’s second possession and returned it for a touchdown to knock the Seahawks out of the playoffs. In 2005, Holmgren’s right-hand exec, vice president Ted Thompson, went back to Green Bay to run the Packers. He missed out on the Seahawks’ Super Bowl run that season, but he was already laying the groundwork for his own Super Bowl title. He drafted Aaron Rodgers in 2005 and replaced Sherman with Mike McCarthy the next year. After a messy divorce from Favre in 2008, the Packers won the Super Bowl with Rodgers at QB in 2010. Meanwhile, just as Thompson had jumped Seattle’s ship before its Super season, John Schneider left Green Bay in 2010 to join Pete Carroll in Seattle, where Schneider had worked in 2000 under Holmgren and Thompson. Schneider and Carroll’s first year in Seattle was Hasselbeck’s last, and Schneider and Carroll brought another former Packers backup QB, Matt Flynn, to Seattle in 2012. Of course, they also drafted Russell Wilson that year, and the rest is history. He beat the Packers as a rookie on the fortuitous call on his last-play Hail Mary, and he led the Hawks to a surprisingly easy 36-16 win in the 2014 NFL opener. Now, Wilson and Carroll have a chance to do what Hasselbeck and Holmgren could not: Beat the Packers in the playoffs.